Ooty (Ootacamund) the Queen of the Hill Stations, also known as Blue Mountains is one of the most beautiful hill stations in India. This hill station has splendid green downs and lofty hills of extraordinary scenic beauty and is endowed with a salubrious climate similar to the English summer. Located in the Western Ghats at a height of 7,500ft, Oooty/ Udhagamandalam is the headquarters of the Nilgiri district. Ooty was the former summer retreat of the British. John Sullivan, the collector of Coimbatore who founded the first European settlement here, stumbled across Ooty's idyllic scenery in 19th century during one of his nomadic searches for rare flowers. The name Ooty or Ootacamund derives its name from the local Toda word Udhamandalam meaning village of huts. The Tamil 'Whotai' a species of dwarf bamboo that grows in the forests, 'kai' meaning a fruit or green stuff in the middle and the Toda 'mund' meaning a village clapped at the end. Ooty, however, got its name during the British rule, by calling 'WOTYKAMUND' in the Madras gazette. Ooty nestles in an amphitheater created by four majestic hills-Doddabetta, Snowdon, Elk Hill and Club Hill. These hills are part of the Nilgiri ranges that are really the meeting point for the Western and the Eastern Ghats. 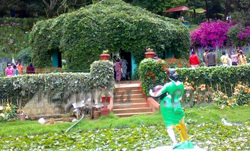 Ooty has become more of a 'honeymooner�s paradise' and a de-facto filming location. 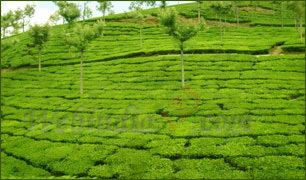 Apart from coffee and tea plantations, trees like conifers, pine and wattle dot the hillside of Oooty and its environs. While visiting you will also come across many eucalyptus trenches . The fresh smell of eucalyptus trees in a trendy and clement breeze will make you psychedelic for sure. The funnel-shaped blossoms covering the hills in floral profusion and the lavender-blue flowers spread over the mountains will pack you with memories for a lifetime. Ooty has many places to see. The idyllic valley views, tranquil forest ranges, beautiful flora and fauna with bustling music of the wildlife. Built in 1847, by an English gardener Marquis of Tweeddale , this quite, beautiful, well maintained garden covers an area of 22 acres. It has 2000 different species of trees, fashioned beds� laid�beds� laid� out� in� an Italian style, beautiful flowers including orchids, a fossil tree trunk of 20 million years, a small artificial pond, alpines and medicinal plants among beautiful lawns and glass houses. The bushes are cut into the shapes of animals and birds. An artificial lake constructed between 1823 and 1825 by Mr.John Sullivan, as an irrigation tank. The 2.5km long lake covers an area of more that 25hectre with the famous narrow-gauge toy railway line running along one bank; rowing boats are available for hire. You can also go for horse-back riding around the lake. This is one of the most popular tourist spot. Pony rides for children is a major attraction. The mini-train for children is still another attraction. About 10km East of the Railway Station, off the Kotagiri Rd 2623 meters the highest peak This is a great place to enjoy the spectacular view of the mountainous valleys and peaks. The place is very serene. This place has a nice view tower wherein you can use high-power TTDC telescope to view surrounding places. On a bright day, one can have a bird's eye view of the plains of Coimbatore and Mysore, the plateau towns Ooty and Coonoor and the barracks at Wellington can also be seen at a distance. Situated at a distance of 19 kms. from Ooty, the river has a dam and a power plant. The great charm of the place is its perfect serenity, sparkling atmosphere and enchanting surroundings. The falls, about 6km from the bridge on the main road, are best in July. There is a forest Rest House and a boat House with Restaurant is at Pykara. .Boats are available for hire in Pykara dam. This house was built by John Sullivan. It was occupied by the Principal of the Govt. Art College.� The tribals called it as Kal Bangla (stone bungalow). It is the first church built in Ooty,1820.� It is said that the wood for this church was brought from Tipu Sultan's Lal Bagh Palace in Srirangapatnam after his final defeat.� These wood had to be hauled up by the elephants from the plains.� It has a clock tower, nine tubular bells and a gallery. Asia's No. 1 Water Theme Park - Black Thunder, is set at the foothills of the gigantic Nilgris and 50 kms from Ooty. It is a thrilling and adventures water theme park at Mettupalayam. The water theme park is spread over 65 acres of land with green hills as backdrop and full of coconut and arecanut trees is a pleasant atmosphere. This park has adventurous water games and land games.